"Very healthy recipe with tons of superfoods." Bring water and quinoa to a boil in a saucepan. Add salt, black pepper, and garlic. Reduce heat to medium-low, cover, and simmer until quinoa is tender, 15 to 20 minutes. Heat 1 tablespoon oil in a skillet over medium heat; add onion. Cook and stir until translucent, about 2 minutes. Transfer to a bowl. Add kale and spinach to hot skillet; cook and stir until tender, 2 to 3 minutes. 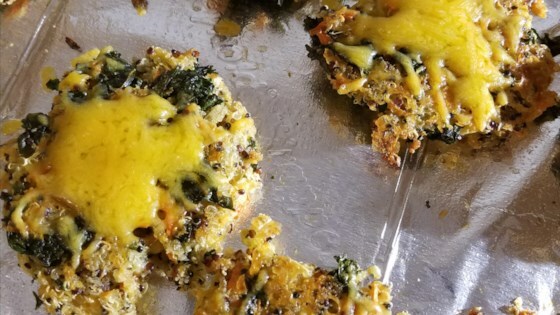 Combine cooked quinoa, onions, kale, spinach, mozzarella cheese, bread crumbs, and flaxseed meal in a bowl; stir to combine. Add beaten egg; mix well. Preheat oven to 350 degrees F (175 degrees C). Oil a baking sheet. Form golf-ball-size portions of the quinoa mixture into patties. Place on the prepared baking sheet. Bake in the preheated oven until golden brown and crusty, about 15 minutes per side.